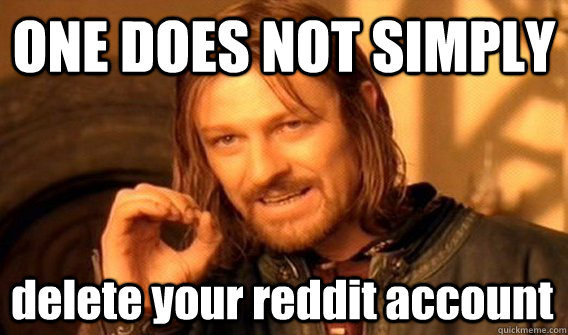 If you are sick and tired of getting downvoted, your productivity at work has diminished dramatically and you want to cure yourself from wasting all your time on Reddit – you may want to learn how to delete your Reddit account. 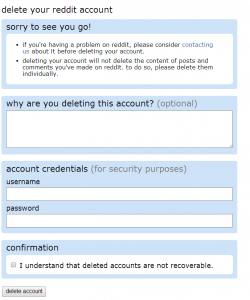 Here’s how to close a Reddit account in 3 simple steps. You’re presented with a form, just input your username and password, click the confirmation checkbox and hit the delete button. If your goal is to erase all your comments, note that deleting your account will not delete your comments as well. Also, deleted accounts are not recoverable. Therefore make sure that you delete any comments you don’t want prior to deleting your account.